Following the fall from grace of the Hohenstaufens, the castle was mostly used as a prison. Frederick's three grandsons were condemned to life imprisonment in the Castel del Monte. One escaped after 30 years, only to disappear into Egypt." "Noble families of Andria took refuge in the castle during the plague of 1665. Later, abandoned as of the XVII Century, it was stripped of its marble and sculptures, and inhabited by shepherds and brigands. Recovered by the state in 1876, it saw some restoration initiatives at long last." "So why did Frederick build it? 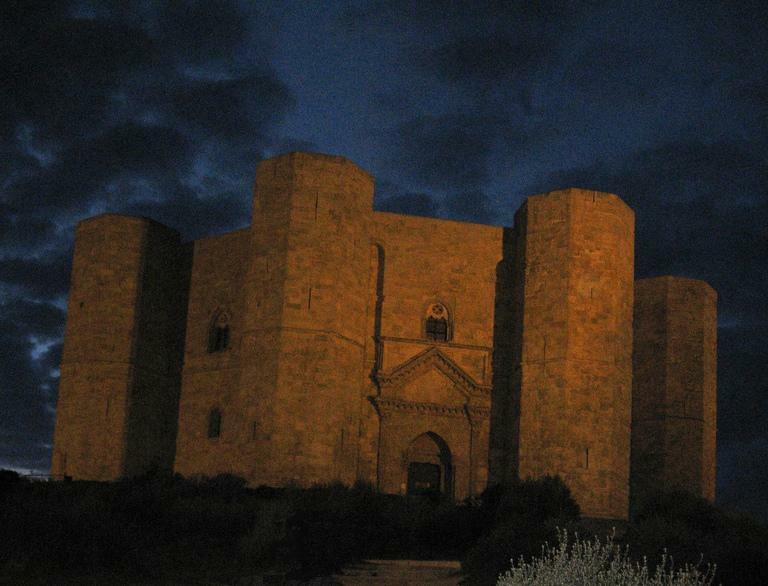 His castles all over Sicily and southern Italy were certainly meant to express imperial power. But in this building we see something more. It's a dark and closed place inside, with a form so coolly mathematical as to be beautiful. A contemporary looked at it and wrote "Stupor mundi et immutator mirabilis". That was more an astonished outcry than a sentence. It meant something like, Amazed world -- wondrous novelty!" ne question still remains: the number eight. So much else about the Crimson King can be traced back to Frederick II. Can the obsessive repetition of the number eight in the design of Castel del Monte be related to the Crimson King? Of course Frederick would put an air association in his shrine, Zeus being the God associated with this element. A wind-rose could be considered a way of talking to the wind. The Crimson King chased the wind of a prism ship - an eight sided prism perhaps? Could the prism ship be Castel Del Monte? and the foundation number of the universal authority. In Christian symbology "8" represents the union of the Infinite (God) and the Finite (man). 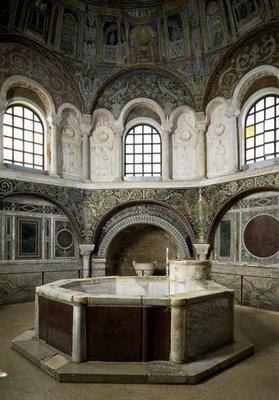 In fact, in the IV Century, the Bishop of Milan, Ambrogio, introduced the octagonal shape for baptistries in order to underline the importance of being baptised. Whether, on conceiving this structure, Frederick II intended to link the Infinite to the Finite (and symbolically the East to the West) is only one possible interpretation that should (debatably) be taken with a pinch of salt. Just out of curiosity: note that the sum of the numbers of the year that Frederick died - 1250 - is eight." "The central mythic image of Hermeticism occurs in the first treatise of the Corpus Hermeticum, "Poimandres, the Shepherd of Men". It is the description of the ascent of the soul after death, and its surrendering of its energies to the successive spheres of the seven planets. When it has given them all up, it can pass the Eighth Sphere (the Fixed Stars) and join the company of the Blest." "The octagon, with a ninth point in the center, is also central to the mystical symbology of Sufism. 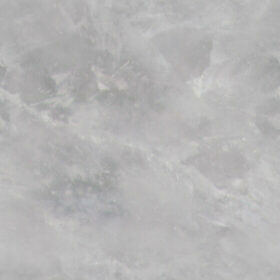 It is the seal or design which Ernest Scott says 'reaches for the innermost secrets of man'. Meaning wholeness, power and perfection, this primary geometrical symbol is one which Sufis associate with Shambhala ..."
"The Law of Octaves was first suggested by Pythagoras in ancient Greece. Having observed that the eight notes of the conventional Occidental musical scale were governed by definite mathematical relationships, Pythagoras proceeded to create a whole cosmology based on 8s. In this octagonal model Pythagoras made numerous mistakes, because he was generalizing from insufficient data. However, his work was the first attempt in history to unify science, mathematics, art and mysticism into one comprehensible system and as such is still influential. Leary, Crowley and Buckminster Fuller have all described themselves as modern Pythagoreans. In China, roughly contemporary with Pythagoras, the Taoists built up a cosmology based on the interplay of yang (positive) and yin (negative), which produced the eight trigrams of the I Ching, out of which are generated the 64 hexagrams. Modern geneticists have found that the DNA-RNA "dialogue" -- the molecular information system governing life and evolution - is transmitted by 64 (8x8) codons. In 1973, unaware of Fuller's coupler - which I called to his attention later - Dr. Leary began to divide his 8 circuits into a 24-stage Periodic Table of Evolution. Timothy Leary also began attempting to correlate this with the Periodic Table of Elements in chemistry. But this is strikingly similar to the teachings of Gurdjieff (which may be, according to many, the secret inner teachings of Sufism). The Gurdjieff vibration numbers and the levels of consciousness, as named by Gurdjieff, fit the Periodic Table of Evolution." "The next fundamental law of the universe is the law of seven or the law of octaves. The laws of music are a mathematical analysis of the laws of vibrations. Modern science says that energy is matter moving at a vibration rate of the velocity of light squared. Thus, a study of music is the study of the universe of vibrations. The esoteric study of music is the law of seven consisting of tones, semi-tones, and absent semi-tones or intervals. For example, look at the visible light spectrum seen through the dispersing prism of Sir Newton. The prism deflects the seven colors of red, orange, yellow, green, blue, indigo and violet. Newton, himself, observed the correlation between the musical scale and the visible light spectrum. but, he went no further in exoteric publication than his Optics. Until the discovery of the prism by (Newton), our science did not conceive of visible light consisting of seven independent wave lengths of light, which in unity is white light. However, the occult scientists did and this correspondence is reflected in the seven notes of the musical scale." "In 1971 the Gurdjieff Society finally settled at Sherborne House, Gloucestershire, where in the mid-seventies Robert Fripp attended a one year course. According to his own comments, the experiences at Sherborne dramatically changed Fripp's life, and naturally, from that point on, ideas from the Gurdjieff/Bennett philosophical school are traceable in Fripp's work." In the same article Robert made reference to Harmonic Proportion and the Golden Mean." "You might ask where this came from? In Fibonacci's day, mathematical competitions and challenges were common. In 1225 Fibonacci took part in a tournament at Pisa ordered by the emperor himself, Frederick II. Beginning with a single pair of rabbits, if every month each productive pair bears a new pair, which becomes productive when they are 1 month old, how many rabbits will there be after n months?"" The series resulted from Fibonacci's solution to the problem. "Frederick II was also a friend to the great mathematician Leonardo Fibonacci, who introduced the Arabic representations for zero and ten into European calculation. He (Frederick) built the Castel Del Monte in the 1240s. In a land where snow is rare, it reminds us of the fractal shape of snowflakes. It's a perfect octagon, 123 feet across, with an octagonal center court. Octagonal towers on each corner carry the octagonal theme downward in scale. Its floor plan reflects octagonal Islamic tile work." 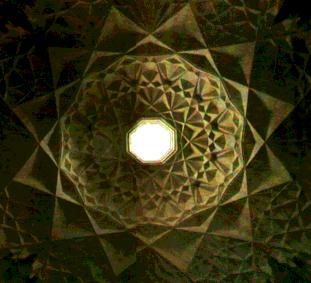 "The building draws on the most powerful thinking about design and mathematics in the Islamic world. The ground plan, seen clearly in aerial shots of the citadel, perfectly illustrates all possible forms of an eight-sided polygon: four symmetrical axes, simple octagon, eight-pointed star formed by two intersecting squares and the pointed star polygon, universally known as the Islamic eight-pointed star. Castel del Monte is, as a computer simulation proves, a fractal whose iterations are immediately apparent -- one of the most beautiful structures ever to rise from the human mind, and the mind, recognizing it, is naturally captivated." "This type of music invites you to engage it on a very personal level. It�s unabashedly cerebral and contemplative. There is a constant fluidity, the sound of stunningly beautiful fractals endlessly generating new stunningly beautiful fractals � spacious, yet finely detailed." "For several years Leonardo corresponded with Frederick II and his scholars, exchanging problems with them. He dedicated his Liber quadratorum (1225; "Book of Square Numbers") to Frederick." "The Fibonacci numbers grow at a rate measured by a certain mathematical constant called the Golden mean. The Golden mean is thought by many people to describe the most aesthetically pleasing rectangle. Starting with such a rectangle, you can partition it as illustrated so that it circumscribes a logarithmic spiral, which in turn models the shape of a shell of a chambered nautilus." form a rectangle with an aspect ratio of the Golden Number." A nautilus is sculpted into an interior wall at the castle. On the inner wall of the nautilus are inscribed the Fibonacci Numbers. The cochlea of the inner ear is shaped like a nautilus shell (the Latin word for snail is cochlea). By inscribing the Fibonacci numbers on the inner ear of his castle, Frederick was relating the numbers to architecture, nature and music. "There may be a mathematical link between the anatomical structure of the cochlea and the theoretical structure of our tonal musical system (Joseph, 1988). The mathematician Pythagorus believed that music was a musical expression of numbers. He discovered that the same ratios of the consonances in our current musical system have the capability of reproducing themselves (the ratio can reproduce itself within itself) (Joseph, 1988). These ratios are referred to as "golden ratios" or "golden rectangles". Interestingly, the structure of the cochlea also exhibits ratios of a "golden rectangle". suggests a possible co-evolution of music as a separate entity. I am reminded of Dawkins idea of the meme, where music is propagating itself through humans, and that music which is best at reproducing itself (consonance) is prospering through natural selection, while the not so successful (dissonance) are dying off." "Usually people think that it is the musicians who create the music, but in fact it is music who creates the musicians."